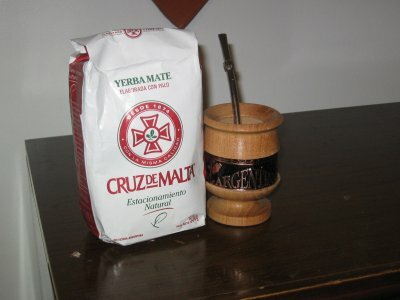 : So one of my homies in Argentina recommended a few of his favorite Yerba Mate teasfor the Tea Amigos to get down with. First up is theCruz de Malta Yerba. Of course, I had my first preview of this loose leaf yerba in my traditional mate gourd, but since few of you are able to obtain such a steeparatus at the moment, I steeped it using standard protocol. I like how these Yerba Matescome in fat packs, similar to flour. The more the merrier. Also, the tastes is powerful and gives you the feeling as if you are really living. The herbs are quite small, so take precaution in your steep. Overall this is a fine mate that reminds me of being below the equator. : His Steepness himself has returned from Argentina, the Yerba Mate capital of the world. It would only be fitting for Dax to bring us back a couple Yerba Mate gourds as well as Cruz de Malta Yerba Mate to steep-a-thon within. As you know I’m a teasan through and through, a jack of all teas of all grades but unfortunately the Yerba Mates I’ve had have all come from a bag. No loose Yerba Mate for me until now. Dax prepped the Crux de Malta right, the way native Argentines have been doing it for years. Learn all about it in his How to Prepare Yerba Mate teasan training (coming soon). Anyway I’m going to tell you like it is. First steep made me weep a little bit because this Yerba Mate tea does not pass the oversteep challenge. Your first few sips will send you on a flavor trip…too much of it. But with some time the flavor becomes fragrant and interesting, nuanced, with a really not-so-subtle burst of parilla-roasted mesquitability. Also of note is that I used a bombilla to drink it out of the gourd for the first time. And this is how the first Cruz de Malta reviewappeared on Tea Amigos. If you want to know more about Yerba Mate rituals, the bombilla, the gourd, and whatnot, don’t forget to read Dax’s How to Drink Yerba Mate article.